Thanks for printing! Don't forget to come back to Dr. Paul Jeffords, MD for fresh articles! Are you suffering from neck or back pain and live outside the Atlanta area? Find out if you may be a candidate for one or our minimally invasive spine surgeries before traveling to Atlanta. When you send us your recent MRI imaging study, Dr. Jeffords can evaluate your condition and determine if you’re a good candidate for one of our procedures. After you submit your MRI, a surgical consultant will contact you within five business days to review your results, get a better understanding of the pain you’re experiencing and answer any questions you may have. 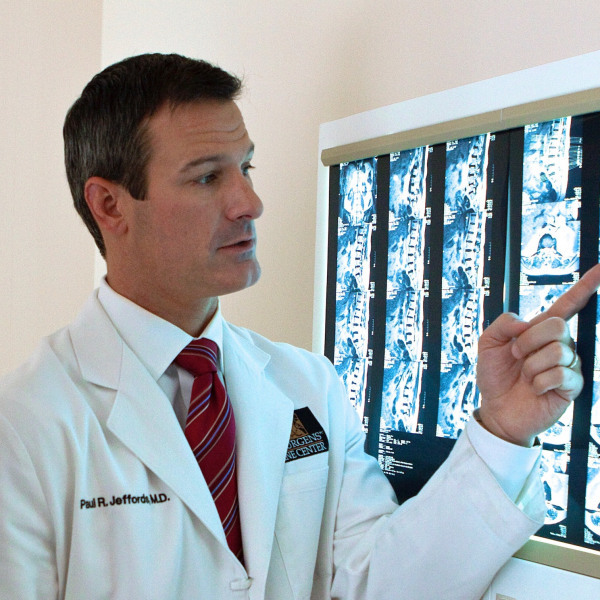 From there, we’ll be able to determine if our minimally invasive spine procedures can treat your condition. Then, you’ll be one step closer to scheduling your surgery and getting back to life without pain. Our no obligation free MRI review is an informational review of the MRI report and/or images that you provide to us and is not a form of diagnosis. A diagnosis and a final determination of whether you may benefit from treatment with Dr. Paul Jeffords can only be made after you have been physically examined by our medical professionals. The MRI Review has no value and will not be billed. MRI reviews are preliminary, and some patients' individual medical conditions may require additional testing. By filling out an MRI Review form, you acknowledge that (1) The MRI review is only an informational review of the documents and/or images that you are providing; and (2) The information provided by our staff is not a diagnosis. A diagnosis can only be made if you have been physically examined by Dr. Jeffords or his physician assistants. By providing your telephone number to us via this contact form, you acknowledge and agree that you may receive a telephone call from us, at the number you provided via the online form, to receive information regarding the services provided by Dr. Paul Jeffords. Such telephone calls may be placed via an automatic telephone dialing system and/or may contain prerecorded messages. By providing your mobile number to Dr. Paul Jeffords, you further acknowledge and agree that you may receive text messages (SMS) from us at the number you provided. Individual spine conditions, treatment and recovery times may vary. Each patient's experience with spine surgery will differ. All surgical procedures involve some level of risk. If directed to pursue surgery by your physician, prompt action is advised, as waiting may reduce the efficacy of surgical treatment. Postoperative instructions vary from patient to patient. Follow your doctor's advice. These procedures are reserved for those patients medically cleared and scheduled for treatment. The opinions expressed in patient testimonials are by patients only; they are not qualified medical professionals. These opinions should not be relied upon as, or in place of, the medical advice of a licensed doctor or other health care provider.